A year ago I wrote about London, my city, in sorrow and pain. The city was in flames, landmarks of my life wantonly destroyed in the riots, and I grieved, for the destruction of so much that was good about the place. Although I love Oxford, where I have lived for the past four years, I am a true, unabashed Londoner; and within that, very much a South Londoner, even though it's almost sixteen years since I lived on the right side of the Thames. Before I moved to Oxford I lived in East London, only twenty minutes' walk from Stratford, home to the 2012 Olympics. 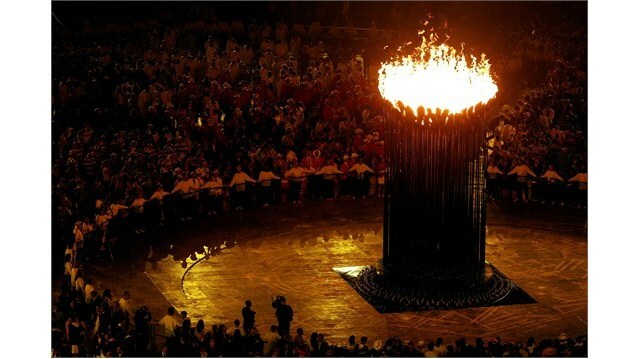 I rejoiced when we won the Olympic bid, and remember the events of 7/7 only too well. I was part of TELCO, the East London branch of London Citizens, which campaigned for an ethical Olympics: a living wage for all employees, and a legacy including turning the athletes' village into affordable housing. (You can read more about this here). Since moving I continued to follow the news of enforced demolitions and further campaigning with interest. The Olympic Park and its buildings are lovely but they have their shadow side, and came at a price. And yet, a year after the rioting and destruction, I can thoroughly enjoy the fact that London is back in the global spotlight! And this time for positive reasons. My city is hosting the world, providing entertainment, volunteers and a great backdrop to road races. The destructive fires from last year have been replaced by a blazing cauldron symbolising unity; the young arsonists replaced by young athletes. Maybe I'm biased, maybe it's only because I'm a Londoner, but I am proud of London, proud to belong to London, and already thoroughly loving these Olympics!! I am loving the Olympics, too, and thrilled with the wonderful opening that England provided us with the first night! That was an incredible show! I am glad that I only leave on vacation next Friday so I can watch the games this week.